Kang In-gu (Song Kang-ho (송강호) is far from the average gangster. While he joins his compatriots in the Dog Gang as they partake in criminal activities and expand their territory, In-gu also wants the joy of having a typical family. Yet his long-suffering wife (Park Ji-young (박지영) and daughter (Kim So-eun (김소은) are deeply ashamed of his occupation, with In-gu’s efforts to impress them and earn their respect constantly failing. Thankfully, due to a great deal secured by In-gu, he can finally quit the gangster lifestyle and focus on creating the perfect home in the suburbs. Yet when the ambitious younger brother (Yoon Je-moon (윤제문) of the big boss (Choi Il-hwa (최일화) makes a play for power, In-gu’s dreams quickly begin to unravel. The Show Must Go On is a unique gangster tale in that director Han Jae-rim does away with the overt machismo and glamourisation of the underworld lifestyle, presenting a more grounded and comedic interpretation of the genre. Crime comedies have become somewhat of a staple in Korean cinema with the Marrying the Mafia and My Wife is a Gangster series, but what sets The Show Must Go On apart from its peers is that overt humour is jettisoned in favour of irony and satire. The original Korean title translates as ‘Elegant World‘ yet In-gu’s life is revealed as anything but, as he works hard in absurd situations in order to provide for his family but succeeds only in upsetting them further. When his daughter’s grades slip, for example, In-gu attempts to bribe the concerned teacher with vouchers incurring greater animosity from the family. 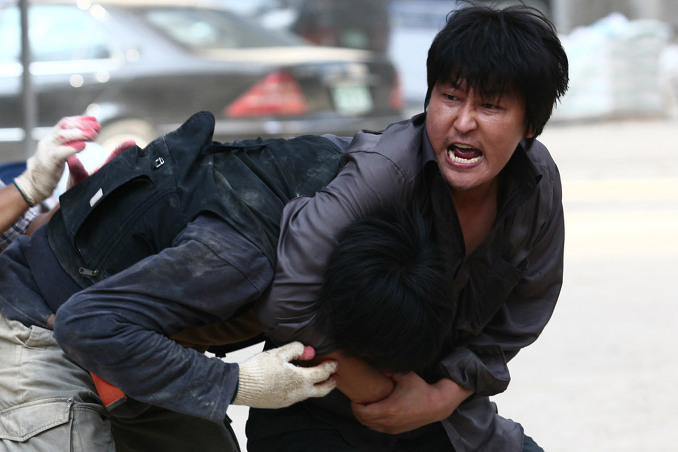 In his role as senior gangster, In-gu is forced to wrestle with a short middle-aged man and bite his fingers in order to acquire prints for a contract. It is through such ironic moments that director Han pokes fun at both the lifestyle and the genre, resulting in a film with a distinct identity. That said, the humour within the crime-comedy-drama misses more often than it hits. While director Han competently helms the action and creates certain confrontations that raise a smile, others mostly just fall flat and give way to violent conflict, dramatic scenes, or a combination of the two. As such the tone within The Show Must Go On veers uncontrollably throughout the narrative and is incredibly uneven from beginning to end. Certain set-pieces – such as a battle royale between gangsters and striking construction workers, presented as comedic through the overtly feminine fighting styles of the supposedly tough criminals – make light of keen social problems which tends to seem in bad taste. Legendary supporting actor Oh Dal-soo is employed to help bring a greater element of fun as In-gu’s best friend from a rival gang, however his paltry screen-time unfortunately allows him little room to maneuver. The uneven tonal balance extends to The Show Must Go On’s weak final act, where the film disappointingly falls into repetition and melodrama. At 112 minutes the film doesn’t have a particularly long running time yet due to the imbalances and protracted finale, tedium sets in ultimately resulting in a film which feels overly long. What makes The Show Must Go On watchable and entertaining is the highly charismatic performance of Song Kang-ho, who carries the entire film on his talented shoulders. The star has made a career out of playing incredibly likable, bumbling, well-intentioned fools and he channels such prowess brilliantly into the character of In-gu. Song also manages to construct the protagonist as so appealing that a great deal of sympathy is almost demanded from the audience, despite In-gu’s status in the criminal underworld. The actor conveys the gangster first and foremost as a sensitive husband and father, desperate to do right by them yet as he is his own worst enemy, he simply creates further embarrassment and tension. In removing the overt machismo and swagger so often associated with the genre and constructing In-gu as a character with more diversity and depth, Song has taken a highly uneven script and made it an engaging drama. 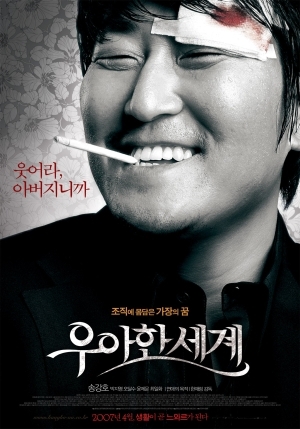 The Show Must Go On is a unique offering by director Han Jae-rim, who seeks to construct a gangster comedy with ironic and satirical sensibilities. The result is very hit-and-miss with a tone that is generally all over the place, despite the competent directing on display. The film is saved however by Song Kang-ho’s wonderful performance as a sensitive father/criminal, and fans of the actor will no doubt find much to enjoy.